"The ideal cardio program would be just long enough to 'spark' your metabolism for that important post-exercise fat "burn" but not so long that it begins to eat away at your hard earned muscle!" 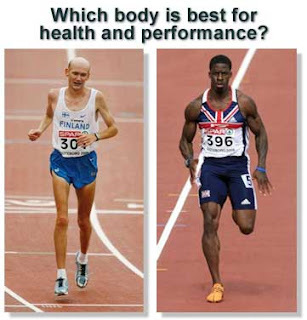 Would you rather look AND function like a sprinter or marathon runner? I believe in the above picture it answers that question for most. Interval training is great and requires a lot less time than typical conventional cardio which is very inefficient to blast fat as well as time wasting. The goal for interval training is quite simple and that is the same as those folks who practice conventional cardio: Blast Fat and Increase Cardio Conditioning. I don't endorse running as a part of a normal fitness program unless it's something that you really enjoy or use for recovery such as 15-20 minutes on your "off" resistance training days. Most people don't enjoy running and/or just shouldn't do it and that's why they come to Synergy Kettlebell Training. I personally don't believe running is that effective or efficient in terms of building fitness and burning calories. If running is your thing, cool. No prob. But Synergy Kettlebell Training is the alternative to running, MUCH more effective in terms of total calories burned minute for minute during exercise, post exercise oxygen consumption(which is the continuation of caloric burning up to 48 hours post workout), maintaining an anabolic state (state for muscle building and recovery - the more muscle you have the higher your metabolism is and less fat you will have), and creating positive changes in your overall body composition. If you are going to "run" on your off days I recommend a much more efficient approach that won't have you wasting countless hours, pairs of shoes, and sweat buckets beating the pavement with shocks to your joints all over town. The protocols are quite simple so I won't spend too much fluff time telling you about it. Choose your exercise whether it be the elliptical cross-trainer, treadmill, stairmaster, street running, hill running, etc. You do NOT exceed 20 minutes-which is considered a perfect amount of time for intervals because the intensity will be very high. 3-5 times a week max! If you enjoy just going out and running by all means continue to do that, but in order to efficiently and consistently fat blast and increase your cardio conditioning you must, must, must perform high intensity type cardio. Your goal is NOT to burn a specific amount of calories because more than double what the machine's read-out will say would have been used. Your goal IS to keep your intensity as high as possible. This will bring your cardiovascular conditioning to levels you never thought possible as well as peak your metabolic rate- essentially expending a greater number of calories while at rest (which is what you do most of the time). Short blasts of high intensity cardio snaps the trainee out of the adaptive "steady state" the body wisely seeks to conserve energy (calories) when practicing the same pace, low intensity, long duration protocol of ordinary aerobics. Cardiovascular conditioning is achieved much sooner according to studying physicians. When it comes to the heart rate question— whether to stay lower or higher — this is your answer. At a lower % of max heart rate (65%), a larger percentage of calories burned come from fat than at a higher heart rate (75-85%). HOWEVER, despite the percentages, you will burn more total calories and therefore more total fat calories at a higher heart rate. The key to developing the cardiovascular system without an unacceptable loss of strength, speed, and power is interval training. Interval training mixes bouts of work and rest in timed intervals. Train as mentioned in the below routines and achieve a great, great feeling and looking body. Pick any of the 3 below each time you train and you can do the same one more than once per week if you would like. Additionally to this you will need to perform regular strength training exercise or you will not build muscle. If you weight train you will increase your metabolism for up to 38 hours post training which continually burns calories all day long- not just while you're exercising. That's great news isnt it!!! -The following options are merely that- options as you can perform many others. Please perform all exercise with caution and with the understanding that you do so at your own risk. By the way if you get finished with these and still think you should do some conventional cardio afterward, you did NOT go hard enough during your intervals. Setup: Incline can be used as much as a resistance as increasing the speed can. Process: You want to get your heart rate up as high as it takes so that you cannot speak without difficulty. Use the "No Talk Rule". If you can't talk you're doing it right. IF you can go faster. Now during your slow minute you bring your heart rate back down to a manageable pace so that you can recovery in order to complete your next fast minute. -Remember this is for 1 minute slow and 1 minute fast for a total of 20 min. My favorite(I do this a couple times a week and that's all the cardio I do). The working period is a all-out/non-stop sprint followed by the rest period which is a non-working rest. The rest is you actually standing in place, not moving and catching your breath for the quick 10 seconds. Length of training session: 20-30 min. Protocol: Consistent speed and changing incline. Every 3 min. raise incline to 10-15%. For example: The first 2 min. will be at a 0% incline and speed of at least 3.0- 10mph. The 3rd minute will have the incline raised to 10-15% for the entire minute. The 4th and 5th minute will have the incline at 0% and speed stays consistent. Continue this protocol for the remainder of the 20-30 minutes training session. Should you have any questions or need a demonstration for these exercises please consult a fitness professional such as myself. This cardio program is part of an overall conditioning program. Remember that: This is an intense workout, but it takes hard work in order to achieve the best results.